Armatic's integrated NPS Feedback module allows companies to "take the pulse" of their customer base to gauge loyalty, generate feedback and drive inbound leads. 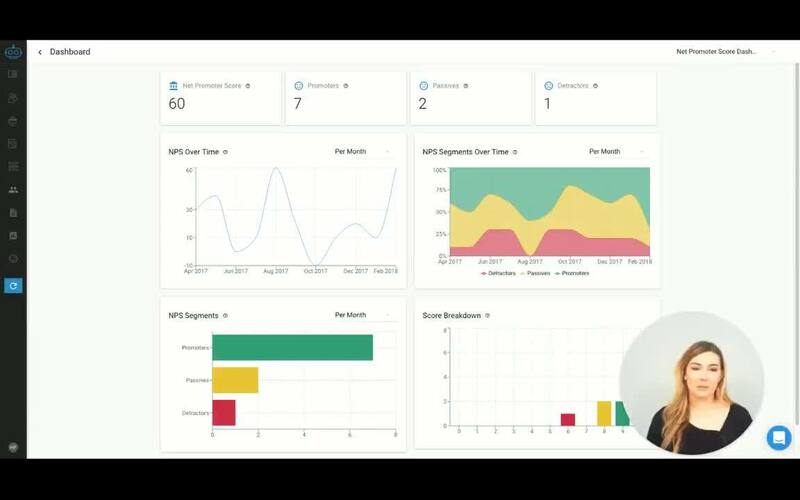 Our NPS solution focuses on simplicity and automation, providing powerful results with almost zero setup or maintenance. This guide will walk you through how to enable and implement NPS as well as some best practices. Net Promoter or Net Promoter Score a very simple one question survey, asking the recipient to provide a rating based answer on a scale of 1-10 to a question regarding how likely they are to refer the company to someone they know. It serves as an alternative to traditional customer satisfaction research and has been correlated with revenue growth. As such, NPS has been widely adopted by more than two thirds of Fortune 1000 companies, using the data to generate referrals, build a social media presence, gather customer reviews reviews, direct customer success/service resources, solicit product feedback, and more. NPS Feedback is already enabled for your account, however, it is turned off for your "User Role" by default. To enable NPS feedback: first, go to Account > Users to determine which Role your user profile is assigned to. Once you've identified your assigned Role, go to Account > Roles and select "Edit" under the "Actions Menu" (three dots) of your assigned role. To enable the NPS Dashboard, select the "Dashboard" tab under Role Details and change "Net Promoter Dashboard" to "Full". By default, NPS surveys are "Enabled" for all Customers and Contacts. NPS surveys will be sent to any customer contacts with "NPS Enabled", which is the default setting. Disabling NPS Feedback can be done at the customer or contact level. From the Customer page, select, the check box next to the customer(s) record and then select "Disable NPS Surveys" under "Batch Actions" on the top left of the page. You can also quickly see all customers' NPS status in the customer list by enabling "NPS Surveys" under the Customer List View Settings. Select "Edit" under the action menu from the customer's detail page. Locate the contact(s) and select "Disable NPS Surveys" from the action menu. The "Campaign Start Date" is the the date the surveys will be generated for existing customer contacts with with "NPS Surveys" enabled. This is the amount of days from either the "Campaign Start Date" for existing customers or from the first NPS survey date for new customers before the next survey is generated. Identify how many days from customer creation (in Armatic) before they will receive their first survey. Selecting "Send an email automatically" will automatically queue up the survey to be sent in the next email delivery window. If this option is not selected, a task will be created in the "To-do" list to "Approve" the survey to be sent or to "Cancel" the survey from being sent. 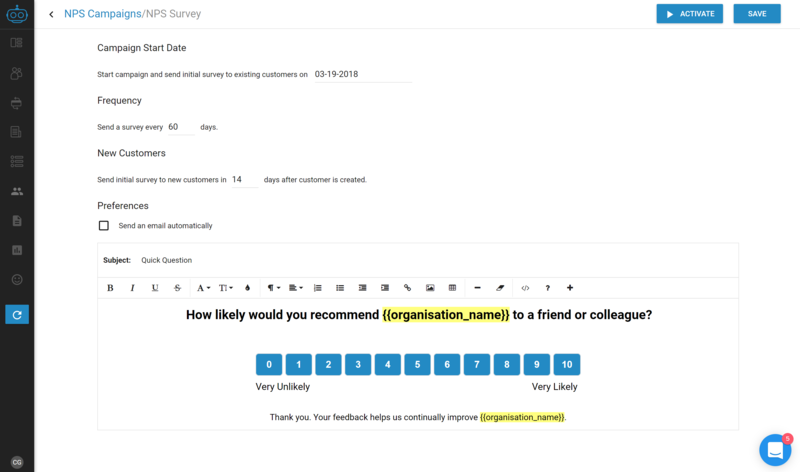 Edit the content of your NPS survey using the standard Armatic text editor. When you're ready, select "Activate" in the upper right corner of the page. An Active NPS Campaign can be stopped at anytime by selecting "Stop" in the upper right hand corner of the NPS Campaign Settings Page. NPS responses will be available for review under the "NPS Feedback" page, now viable in the left navigation area. You can respond to your customer using a saved email template or by manually typing in a message under the "Write a response" section. Once a response has been sent the recipient's feedback will be marked as "Responded". You can manually mark feedback as responded by selecting the "Mark as Responded" text. A score of 0-6 are "Detractors", these customers are telling you they are not happy, about half of them are likely to churn within 90 days. Follow up with with these customers should be to try to understand their experience with your company to date, see if there is anything you can learn from and fix. A score of 7-8 are "Passives", these customers like your product/service however are still likely to leave if something better or cheaper comes along. These customers could be considered your "Average" customer and could provide valuable insight into how you could improve your product/service. Companies have also had success improving passive's scores with free upgrades, discounts, access to select product/services etc. A score if 9-10 are "Promoters", these customers are your champions. You'll want to show appreciation, nurture the relationship and ask for help getting the word out about your company. 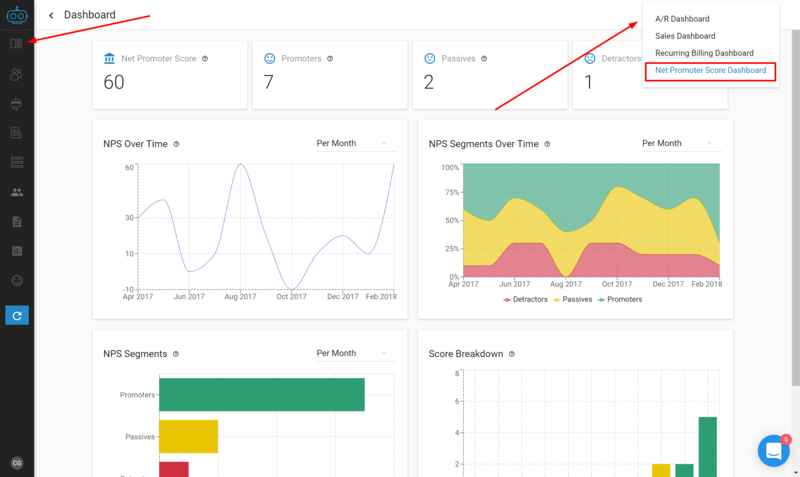 To access the NPS Dashboard, select the drop down menu in the upper right corner from the Dashboard tab, and select "Net Promoter Score Dashboard"
The NPS Dashboard helps you understand your campaign results and provides quick access to NPS summary data. The reports includes breakdowns of of total survey responses, Total NPS scoring/segment trends, respondents by NPS category and others.